Q: Which muzzle size should I order? The best way to determine size it to measure your horse’s face using the sizing chart below. The diagram above indicates where to measure. 1. Determine the style you would like and then refer to the sizing chart to choose a size. Most horses wear the same size muzzle as halter, but not always. After choosing a style and size, note the depth and circumference of the muzzle. Because horses’ heads are generally tapered like an ice cream cone, measuring the circumference of the face at the right spot is critical to finding the correct size muzzle. 2. Stand to the side of your horse looking at the profile of his head. Start at the tip of his lips (where your hand would be if you were to give him a treat) and measure up towards his ears to the depth of whichever muzzle you think you need. For example, if I think my horse needs the horse size and I want the Deluxe style, I would measure up his face 7-1/2″. 3. At this point, measure the circumference keeping the tape snug. For my example, if the circumference of my horse’s face at this point is 23″-24″, the horse size Deluxe would most likely fit my horse. My horse will need at least an additional two inches for chewing and regular movement of the jaw. 4. If you are in between sizes, get the larger size. The muzzles are intended to have a roomy fit. Q: How should the grazing muzzle fit? The muzzle should not be tight or restricting and should allow room for grazing and chewing. You should be able to fit two to three fingers sideways between the grazing muzzle and the horse’s face. The Standard muzzles have a slightly closer fit. Check regularly for rubbing, especially when introducing the horse to the muzzle. If necessary, use padding such as sheepskin or a Muzzle Mate (see Accessories) to cushion sensitive areas. Having the proper fit and adjustments will help avoid rubbing. Q: How should I adjust the Deluxe Grazing Muzzle? For the most comfortable fit and to prevent the muzzle from coming off the horse’s nose, adjust the muzzle so that the throat latch fits behind the horse’s jaw bone, if possible. It may help to put the muzzle over a well-fitting halter and adjust the straps so that the muzzle fits as closely as possible to the halter. Q: The muzzle keeps coming off my horse’s nose. What Can I Do? Check your fit and adjustments. If the muzzle is properly adjusted the muzzle should not come off over the horse’s nose and the horse should not be able to get the headstall off over its ears. Having the proper fit and adjustments will help avoid rubbing and prevent the muzzle from coming off. Adjust muzzle straps to fit like a well-fitting halter with the throat strap behind the horse’s jaw bone and the rings in the crease of the neck. 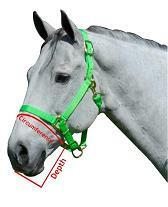 It may be helpful to put the Deluxe Muzzle over a halter to make the initial adjustments. In the summer, using a fly mask helps keep the muzzle on. If your horse is difficult to fit or is a “Houdini” that seems to get out of everything, we recommend the either the Standard Grazing Muzzle used with a separate, well-fitting breakaway halter, or our new Have A Heart grazing muzzle with V-strap to keep the muzzle from coming over the horse’s nose. Q: How is my horse going to react to the muzzle? Don’t expect your horse to actually like wearing the muzzle, just as we humans don’t like going on a diet. However, most horses adjust quite easily. In fact, the March 2006 issue of The Horse Journal described it as a “non-event” for most horses. We’ve had many customers tell us that their horses associate the muzzle with being able to go out and graze and be with their friends so they put it on quite willingly. Your attitude will make a big difference. Act matter-of-factly when you put it on your horse. Don’t apologize! Q: How should I introduce my horse to the muzzle? Q: How long will a grazing muzzle last? Grazing muzzles take a lot of abuse so expect to replace it periodically if your horse uses it for extended periods. Many horses use the same muzzle for several seasons and some horses may go through more than one a season. It depends on factors such as the amount of time it is worn, whether you have a gentle horse or a more aggressive horse and the age of the horse. Since the teeth on older horses protrude, we have found that generally the older horses will wear out a muzzle more quickly. Compare the life of a muzzle to the life of a pair of running shoes. The outside bottom of the muzzle is being rubbed on the ground and the inside bottom is being scraped by your horse’s teeth thousands of times a day. We have made every effort to make the rubber as durable as possible, but expect to periodically replace your muzzle. Q: How much grass can the horse get while wearing a Best Friend Grazing Muzzle? It’s difficult to say how much your horse would be able to get through the small opening, but we estimate that it cuts intake by an average of 50% to 75%. The opening may seem small at first, but most horses become quite proficient at getting grass through it. Keep in mind that if the muzzle or safety halter breaks away in the pasture your horse will have free access to grass. If your horse is in danger of founder s/he should be monitored regularly while grazing.